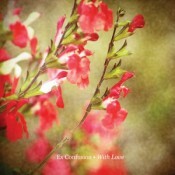 It’s been a while since I came across a release as gentle and serene as Ex Confusion’s With Love. Composer Atsuhito Omori has apparently found a way to melt guitar and keyboards into a fine mist which he applies via three- to five-minute vignettes that float along, leaving a quite pleasant lull in their wake. He plays with the fading resonance of his acoustic elements, the hanging sounds and echoes laying down a constant backdrop for the slow melodies at play. The title track is a great example, taking a simple and lovely piano melody and letting its story trail off as it goes, its own voice deepening the dimension of the piece along the way. Omori’s style is classic slow-handed ambient; there’s a nice patient sensibility to it all. He eases ambient pad-like tones out of his guitar, laying them out in a familiar rise-and-dissipate style, and the calmness it evokes slows your breath and soothes your soul. His piano pieces are beautifully played–listen to “Only An Angel,” where he brings misty drone up behind a repeating piano phrase, submerging his melody in an increasingly dream-like space. Though the songs here are brief–and let me get back to that–each is thoroughly loaded with emotion. It’s a very personal disc, and it’s easy to internalize it to bring your own thoughts and sensations into play. The brevity, while not typically sounding too short save for a couple of quick fades that had me thinking, “That’s all?”, makes me wonder what Omori could do in a longer format. And not just wonder, but actually hope for. He clearly gets the ambient mindset; now I’d like to hear him break out of the pop-song time frame. If With Love is any indication of what this self-taught musician has in store, it would be very good indeed.